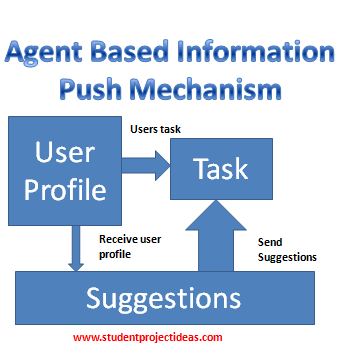 The main objective of the Agent Based Information Push Mechanism is to provide required information to the user who would be interested in that information. Now, we are using this technique in Web-site Advertising. It will show the specific advertisements that a user with a certain profile would be interested in. Best examples are Yahoo!, Google sites. We can use this technique in other fields where a user with a known profile contacts an information system such as a website. Based on the previous search history and profile of a user, that user’s behavioral profile will be determined and the information push system will use this behavioral profile in finding the information that the particular user is interested in, also it will displays that information to the user. The Aim of this project is to develop an agent-based information push mechanism. In this system, the user activities such as what writing and storing information on a word document will be monitored by an agent program. Then it will provide some suggestions to him, for making his work easier and efficiently. This suggestion may be it will search a store house for the specific documents which can help the user in making his work easier through internet and then it will supplies those documents to user. This system saves the user’s time in searching for help on his activity and he can finish his work in less interval of time. The agent will offers help to the user, so it will be included in the information push systems. By using this system a user can do more work.